MINNEAPOLIS & REHOVOT, Israel--(BUSINESS WIRE)--Apr. 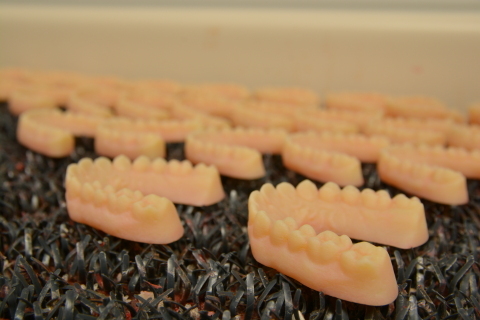 4, 2018-- Stratasys (NASDAQ: SSYS), a global leader in applied additive technology solutions, today announced that top laboratories in North America and Europe are successfully driving large-scale production of clear aligner molds with the Stratasys J700 Dental™ 3D Printer – built on advanced PolyJet-based technology. Offering a unique combination of throughput, quality, and time-to-final part - Stratasys solutions enable growing orthodontic and dental laboratories to rapidly capitalize on the clear aligner marketplace, with professional-grade, easy-to-use and cost-effective 3D printing technology. A popular alternative to complex and manual placement of traditional dental braces, clear aligners offer patients a more aesthetically-pleasing and easily maintained orthodontic treatment. Customers such as Missouri-based DynaFlex® and Malaga-based Ortoplus are increasingly seeking more cost-effective and efficient approaches to compete in the clear aligner market – currently experiencing annual growth of about 17.5 percent. High-speed, production-grade 3D printers alongside digital production processes are often critical to lowering barriers-to-entry. Designed to meet the challenges facing growing orthodontic and dental customers, the Stratasys J700 Dental 3D Printer is engineered to address large-scale capacity and high-throughput requirements for production of clear aligner molds. Powering lab production rates of more than 400 molds per day, the system is optimized for highly accurate 3D prints with minimal calibration and learning required to move the system into production. Based on award-winning PolyJet technology, the J700 Dental 3D Printer enables seamless digital workflows supported by GrabCAD Print™. The technology allows users to capitalize on smart default settings, tips and notifications for a more seamless 3D printing process. Customers can also access detailed model views alongside tray and slice previews to implement intricate, detailed adjustments before going to print. To learn more about the power of Stratasys 3D printing solutions at work, please download our newest DynaFlex case study. Stratasys is a registered trademark, and PolyJet, J700 Dental, GrabCAD Print, and the Stratasys signet are trademarks of Stratasys Ltd. and or its subsidiaries or affiliates. All other trademarks are the property of their respective owners.